DALLAS —A woman’s heart attack may have different underlying causes, symptoms and outcomes compared to men, and differences in risk factors and outcomes are further pronounced in black and Hispanic women, according to a scientific statement published in the American Heart Association’s journal Circulation. “Despite stunning improvements in cardiovascular deaths over the last decade, women still fare worse than men and heart disease in women remains underdiagnosed, and undertreated, especially among African-American women,” said writing group chair Laxmi Mehta, M.D., a noninvasive cardiologist and Director of the Women’s Cardiovascular Health Program at The Ohio State University. 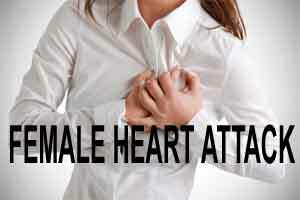 Heart attacks caused by blockages in the main arteries leading to the heart can occur in both men and women. However, the way the blockages form a blood clot may differ. Compared to men, women can have less severe blockages that do not require any stents; yet the heart’s coronary artery blood vessels are damaged which results in decreased blood flow to the heart muscle. The result is the same – when blood flow to the heart is decreased for any reason, a heart attack can occur. If doctors don’t correctly diagnose the underlying cause of a woman’ heart attack, they may not be prescribing the right type of treatments after the heart attack. Medical therapies are similar regardless of the cause of the heart attack or the severity of the blockages. However women are undertreated compared to men despite proven benefits of these medications. Women face greater complications from attempts to restore blood flow because their blood vessels tend to be smaller, they are older and have increased rates of risk factors, such as diabetes and high blood pressure. Guideline recommended medications are consistently underutilized in women leading to worse outcomes. Also, cardiac rehabilitation is prescribed less frequently for women and even when it is prescribed, women are less likely to participate in it or complete it. Compared to white women, black women have a higher incidence of heart attacks in all age categories and young black women have higher in-hospital death rates. Black and Hispanic women tend to have more heart- related risk factors such as diabetes, obesity and high blood pressure at the time of their heart attack compared to non-Hispanic white women. Compared to white women, black women are also less likely to be referred for important treatments such as cardiac catheterization..